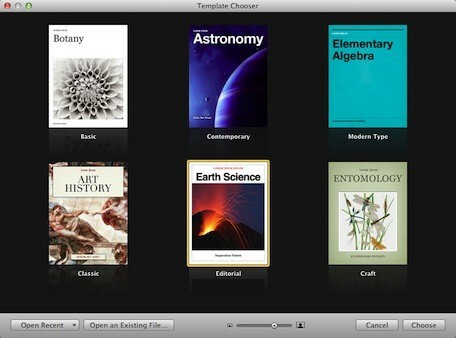 A look at Apple’s free creation e-textbook tool: iBooks Author. What a peek it provides into the future of self empowered publishing. TUAW’s Erica Sadun and I are ebook publishers. Late last year, we started up an ebook publishing company — Sand Dune Books — and were fortunate to hit a publishing home run right off the bat with our book “Talking to Siri.” Since we’re familiar with the tools used to create documents for publishing on both the Amazon Kindle bookstore and iBookstore, we were both curious to see what Apple was going to announce on Thursday. The free creation tool, iBooks Author, wasn’t a surprise to us, and now that I’ve had an opportunity to work with the app I thought I’d pass along my thoughts on how it works and why it may not be the publishing tool for everyone. As with Apple’s iWork suite, launching iBooks Author initially displays a set of templates that authors and publishers can use right out of the box to create attractively formatted ebooks. That being said, there are only six templates available. Apple’s emphasis for iBooks Author is to create a vast library of low-cost textbooks, hence the six templates are all textbook-oriented. For authors who are more interested in publishing other types of fiction or non-fiction books, these six templates can be repurposed. After making changes to a template, the custom template can be saved for future use. Anyone who is familiar with Pages will have few problems working with iBooks Author. The two apps are similar in many ways, with the addition of layout-specific tools. There are widgets — familiar to users of Apple’s ill-fated iWeb — that add special functions to ebooks. Those functions include interactive galleries, sound or video media, Keynote presentations, interactive review quizzes, interactive images, 3D rotatable images, and HTML code. For each template, there is a very complete set of paragraph, character and list styles that can be applied to text with a click. New styles can be generated and added to the template as well. In addition, there are a number of page layouts available. The layouts include Chapters, Sections, copyright, dedication, and forward pages, blank pages, and 1 through 3 column pages. Placeholders appear on each layout, and with a click you can replace the boilerplate with your own text or images.